Maurice Jean Jacques Merleau-Ponty (/mɜːrˈloʊ pɔːnˈti/; French: [mɔʁis mɛʁlo pɔ̃ti]; 14 March 1908 – 3 May 1961) was a French phenomenological philosopher, strongly influenced by Edmund Husserl and Martin Heidegger. The constitution of meaning in human experience was his main interest and he wrote on perception, art, and politics. He was on the editorial board of Les Temps modernes, the leftist magazine established by Jean-Paul Sartre in 1945. At the core of Merleau-Ponty's philosophy is a sustained argument for the foundational role perception plays in understanding the world as well as engaging with the world. Like the other major phenomenologists, Merleau-Ponty expressed his philosophical insights in writings on art, literature, linguistics, and politics. He was the only major phenomenologist of the first half of the twentieth century to engage extensively with the sciences and especially with descriptive psychology. It is through this engagement that his writings became influential in the project of naturalizing phenomenology, in which phenomenologists use the results of psychology and cognitive science. Merleau-Ponty was an apologist for the Soviet communism and his justification of the Soviet show trials and prison camps was published as Humanism and Terror in 1947. Maurice Merleau-Ponty was born in 1908 in Rochefort-sur-Mer, Charente-Maritime, France. His father died in 1913 when Merleau-Ponty was five years old. 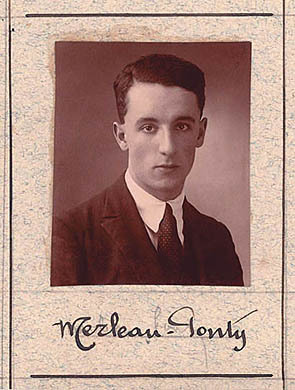 After secondary schooling at the lycée Louis-le-Grand in Paris, Merleau-Ponty became a student at the École Normale Supérieure, where he studied alongside Jean-Paul Sartre, Simone de Beauvoir, Simone Weil, and Jean Hyppolite. He attended Edmund Husserl's "Paris Lectures" in February 1929. In 1929, Merleau-Ponty received his DES degree (diplôme d'études supérieures, roughly equivalent to an MA thesis) from the University of Paris, on the basis of the (now-lost) thesis La Notion de multiple intelligible chez Plotin ("Plotinus's Notion of the Intelligible Many"), directed by Émile Bréhier. He passed the agrégation in philosophy in 1930. Besides his teaching, Merleau-Ponty was also political editor for the leftist Les Temps modernes from the founding of the journal in October 1945 until December 1952. In his youth he had read Karl Marx's writings and Sartre even claimed that Merleau-Ponty converted him to Marxism. While he was not a member of the French Communist Party and did not identify as a Communist, he laid out an argument justifying the Soviet show trials and violence for progressive ends in general in the work Humanism and Terror in 1947. However, about three years later, he renounced his earlier support for political violence, and he rejected Marxism and advocated a liberal left position in Adventures of the Dialectic (1955). His friendship with Sartre and work with Les Temps modernes ended because of that, since Sartre still had a more favourable attitude towards Soviet communism. Merleau-Ponty was subsequently active in the French non-communist left and in particular in the Union of the Democratic Forces. In his Phenomenology of Perception (first published in French in 1945), Merleau-Ponty developed the concept of the body-subject (le corps propre) as an alternative to the Cartesian "ego cogito." This distinction is especially important in that Merleau-Ponty perceives the essences of the world existentially. Consciousness, the world, and the human body as a perceiving thing are intricately intertwined and mutually "engaged." The phenomenal thing is not the unchanging object of the natural sciences, but a correlate of our body and its sensory-motor functions. Taking up and "communing with" (Merleau-Ponty's phrase) the sensible qualities it encounters, the body as incarnated subjectivity intentionally elaborates things within an ever-present world frame, through use of its pre-conscious, pre-predicative understanding of the world's makeup. The elaboration, however, is "inexhaustible" (the hallmark of any perception according to Merleau-Ponty). Things are that upon which our body has a "grip" (prise), while the grip itself is a function of our connaturality with the world's things. The world and the sense of self are emergent phenomena in an ongoing "becoming." Each object is a "mirror of all others." Our perception of the object through all perspectives is not that of a propositional, or clearly delineated, perception; rather, it is an ambiguous perception founded upon the body's primordial involvement and understanding of the world and of the meanings that constitute the landscape's perceptual gestalt. Only after we have been integrated within the environment so as to perceive objects as such can we turn our attention toward particular objects within the landscape so as to define them more clearly. This attention, however, does not operate by clarifying what is already seen, but by constructing a new Gestalt oriented toward a particular object. Because our bodily involvement with things is always provisional and indeterminate, we encounter meaningful things in a unified though ever open-ended world. Merleau-Ponty demonstrates a corporeity of consciousness as much as an intentionality of the body, and so stands in contrast with the dualist ontology of mind and body in Descartes, a philosopher to whom Merleau-Ponty continually returned, despite the important differences that separate them. In the Phenomenology of Perception Merleau-Ponty wrote: “Insofar as I have hands, feet, a body, I sustain around me intentions which are not dependent on my decisions and which affect my surroundings in a way that I do not choose” (1962, p. 440). He carefully considers language, then, as the core of culture, by examining in particular the connections between the unfolding of thought and sense—enriching his perspective not only by an analysis of the acquisition of language and the expressivity of the body, but also by taking into account pathologies of language, painting, cinema, literature, poetry and song. This work deals mainly with language, beginning with the reflection on artistic expression in The Structure of Behavior—which contains a passage on El Greco (p. 203ff) that prefigures the remarks that he develops in "Cézanne's Doubt" (1945) and follows the discussion in Phenomenology of Perception. The work, undertaken while serving as the Chair of Child Psychology and Pedagogy at the University of the Sorbonne, is not a departure from his philosophical and phenomenological works, but rather an important continuation in the development of his thought. David Abram explains Merleau-Ponty's concept of "flesh" (chair) as "the mysterious tissue or matrix that underlies and gives rise to both the perceiver and the perceived as interdependent aspects of its spontaneous activity," and he identifies this elemental matrix with the interdependent web of earthly life. This concept unites subject and object dialectically as determinations within a more primordial reality, which Merleau-Ponty calls "the flesh," and which Abram refers to variously as "the animate earth," "the breathing biosphere," or "the more-than-human natural world." Yet this is not nature or the biosphere conceived as a complex set of objects and objective processes, but rather "the biosphere as it is experienced and lived from within by the intelligent body — by the attentive human animal who is entirely a part of the world that he, or she, experiences. Merleau-Ponty's ecophenemonology with its emphasis on holistic dialog within the larger-than-human world also has implications for the ontogenesis and phylogenesis of language, indeed he states that "language is the very voice of the trees, the waves and the forest." Merleau-Ponty himself refers to "that primordial being which is not yet the subject-being nor the object-being and which in every respect baffles reflection. From this primordial being to us, there is no derivation, nor any break..." Among the many working notes found on his desk at the time of his death, and published with the half-complete manuscript of The Visible and the Invisible, several make evident that Merleau-Ponty himself recognized a deep affinity between his notion of a primordial "flesh" and a radically transformed understanding of "nature." Hence in November 1960 he writes: "Do a psychoanalysis of Nature: it is the flesh, the mother." And in the last published working note, written in March 1961, he writes: "Nature as the other side of humanity (as flesh, nowise as 'matter')." ↑ At the time, the ENS was part of the University of Paris according to the decree of 10 November 1903. ↑ Mark A. Wrathall, Jeff E. Malpas (eds), Heidegger, Coping, and Cognitive Science - Volume 2, MIT Press, 2000, p. 167. ↑ Lester Embree, "Merleau-Ponty's Examination of Gestalt Psychology" Archived 2012-11-21 at the Wayback Machine., Research in Phenomenology, Vol. 10 (1980): pp. 89–121. ↑ Emma Kathryn Kuby, Between humanism and terror: the problem of political violence in postwar France, 1944-1962, Ph.D. thesis, Cornell University, 2011, pp. 243–4: "Merleau-Ponty provisionally defended Soviet “terror”in the name of humanism, writing that so long as the USSR’s violence was authentically revolutionary in its aims, it was justified by the fact that it was helping to produce a socialist world in which all violence would be eliminated." ↑ Emma Kathryn Kuby, Between humanism and terror: the problem of political violence in postwar France, 1944-1962, Ph.D. thesis, Cornell University, 2011, pp. 243–4: "Merleau-Ponty provisionally defended Soviet “terror” in the name of humanism, writing that so long as the USSR’s violence was authentically revolutionary in its aims, it was justified by the fact that it was helping to produce a socialist world in which all violence would be eliminated. ... Yet about three years after it was published, Merleau-Ponty, too, decided that he no longer believed political violence could be justified by the purported humanist aims of the revolution." Alloa, E. (2017) Resistance of the Sensible World. An Introduction to Merleau-Ponty, New York: Fordham University Press. Barbaras, R. (2004) The Being of the Phenomenon. Merleau-Ponty's Ontology Bloomington: Indiana University Press. Carbone, M. (2004) The Thinking of the Sensible. Merleau-Ponty's A-Philosophy, Evanston: Northwestern University Press. Johnson, G., Smith, Michael B. (Eds.) (1993) The Merleau-Ponty Aesthetics Reader: Philosophy and Painting, Chicago: Northwestern UP 1993. Landes, D. (2013) Merleau-Ponty and the Paradoxes of Expression, New York-London: Bloomsbury. Lawlor, L., Evans, F. (Eds.) (2000) Chiasms: Merleau-Ponty's Notion of Flesh, Albany: SUNY Press. Toadvine, T. (2009) Merleau-Ponty's Philosophy of Nature. Evanston: Northwestern University Press.